Super-Lock™ combines a mechanically interlocked transversed key lock system with a unique two-part bonding system to give it superior performance capabilities. Other manufacturers use hubs that depend only on two-part epoxy which can fail in many instances due to poor surface preparation, improper curing conditions, incorrect ratio of catalyst and epoxy, or the quantity of epoxy material applied. The United Abrasives Super-Lock™ system is our exclusive, fail-safe throw-away hub assembly. This is a unique hubbing system that is used on Type 27 and Type 28 grinding and cutting wheels where hub mounting is preferred. The rotational torque placed upon wheels can vary based on material being removed and pressure that is applied. While the chemical bonds that other manufacturers use can fail, the Super-Lock™ Hub ensures the stability of the hub-to-wheel connection. Since 1983, United Abrasives has manufactured and sold millions of depressed center wheels with Super-Lock™ Hubs. Not a single one has ever been reported as a failure. 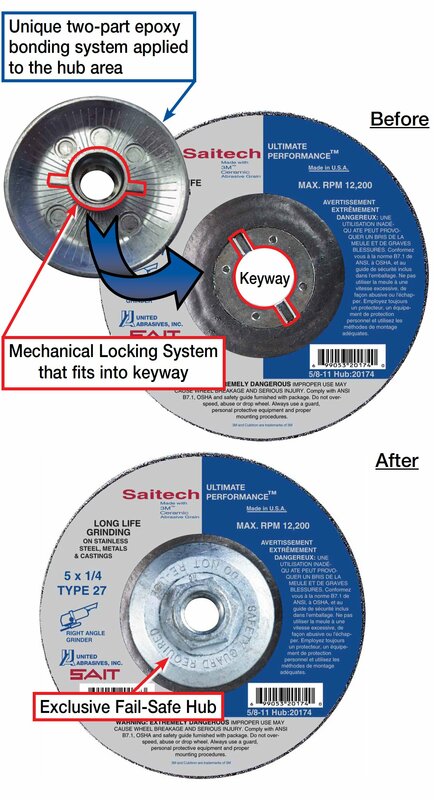 The Super-Lock™ Hub system is so safe that it was originally protected by United States patent #4,541,205. United Abrasives is the only manufacturer to utilize this outstanding hub system. The Super-Lock™ Hub System is available on 4-1/2", 5", 6", 7" and 9" Type 27 and Type 28 depressed center grinding and cutting wheels. Turbo 5" x 1/8", .045" wheels, .090" wheels, .095" wheels and flap discs do not have Super-Lock™ Hubs but use a nonkeyway hub with the same unique two-part bonding system.